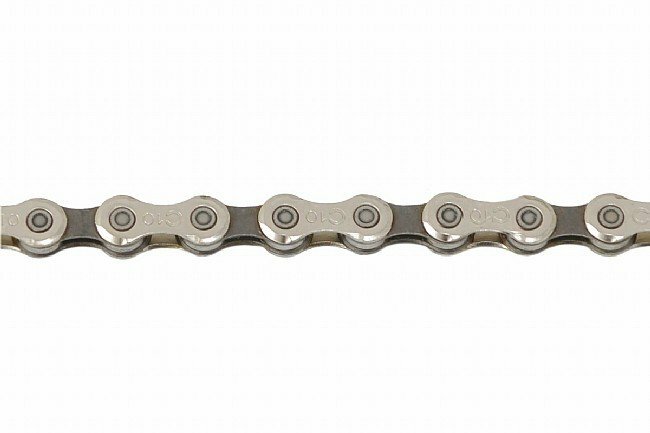 The Veloce 10-speed chain is only 5.9mm wide, making it lighter, quieter running and more efficient than its predecessors. Campy has also added a Ni-PTFE finish to resist corrosion and prevent premature wear, and special link shaping ensures flawless performance with the UltraDrive tooth profiles used on their current 10-speed cassettes and chainrings. The tests carried out in Campagnolo's laboratories show that the resistance to traction, wear, elongation, torsion and flex are identical to the Campagnolo benchmark, the Record 10-speed chain. Solid pins. Includes HD-Link attachment. 274 grams (114 links).